In May 2006 the world’s first underwater park, Molinere Underwater Sculpture Park, opened for public viewing. Located in Molinere Bay, off the west coast of the Caribbean island of Grenada, Molinere Underwater Sculpture Park covers an area of approximately 2,000 square miles and is home to 65 life size human forms cast in cement, ranging from solitary individuals to a ring of children holding hands, facing into the oceanic currents. Anchoring screws secure the sculptures to the ocean floor. The sculptures’ presence has created a beautiful marine seascape of artificial reefs, drawing new life into area. The Underwater Sculpture Park is located two miles north of the capital, St George’s, on the west coast of the island, within an area designated as a National Marine Park, and is easily accessible by boat. The sculptures are placed in clear, shallow waters to allow easy viewing by divers, snorkelers, and viewers in glass-bottomed boats. The section of the underwater park which has attracted the most attention is Vicissitudes which opened in 2007. Located at a depth of 14 feet, it comprises a circle of 26 life-size cement “children,” all holding hands. The figures in Vicissitudes are crafted from a variety of media but predominantly from material on which plants, algae, or certain sea animals, such as barnacles, live or grow, as well as marine grade cement, sand, micro-silica and reinforcing steel. There has been some debate about the intention of the work. It has been suggested that it was a dedication to enslaved Africans who were thrown overboard during the journey from West Africa to the Americas. 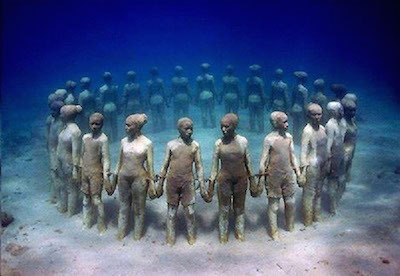 But the founder and creator of the Molinere Underwater Park, Jason de Caires Taylor, says that his decision to submerge his work was influenced by a sense of community, not as tribute to those who perished during the slave trade’s Middle Passage. He envisioned the collective strength of the figures as they formed a circle to resist the currents of the water, achieving that strength through “unity.” He deliberately chose children of diverse backgrounds as models for the casts from which the figures were made. In this manner he hoped to create an image of an expansive, global community. In 2009 Taylor co-founded MUSA (Museo Subacuático de Arte), a monumental museum with a collection of over 500 of his sculptural works, submerged off the coast of Cancun, Mexico. The project is considered one of the world’s most unique travel destinations. Five years later, during the summer of 2014, Taylor submerged “Ocean Atlas” off the coast of the Bahamas. It is currently the largest single underwater sculpture in the world measuring 16 feet high and weighing over 60 tons. Born on August 12, 1974, Taylor is the son of an English father and Guyanese mother. He grew up in Europe and Asia, where he spent much of his early childhood exploring the coral reefs of Malaysia. He was educated in England, graduating from the London Institute of Arts in 1998 with a Bachelor of Arts degree in sculpture. Taylor gained certification as a fully qualified diving instructor and underwater naturalist in 2002. His desire to create striking and meaningful art forms and his love of the underwater world led him to explore the intricate relationships between art and the environment. Underwater Sculpture by Jason deCaires Taylor, http://www.underwatersculpture.com/; Sculptures, Grenada Underwater Sculpture Park, http://grenadaunderwatersculpture.com/sculptures/; Jason de Caires Taylor, “Vicissitudes,” The Black Atlantic, http://sites.duke.edu/blackatlantic/sample-page/depictions-of-the-middle-passage-and-the-slave-trade-in-visual-art/levitate-windward-coast-and-vicissitudes-curatorial-statement/jason-de-caires-taylor-vicissitudes/; Vicissitudes: NOT Sculptural Homage to Victims of the Slave Trade, http://abhmuseum.org/2012/05/vicissitudes-sculptural-homage-to-victims-of-the-middle-passage/. Vicissitudes: NOT Sculptural Homage to Victims of the Slave Trade, http://abhmuseum.org/2012/05/vicissitudes-sculptural-homage-to-victims-of-the-middle-passage/.